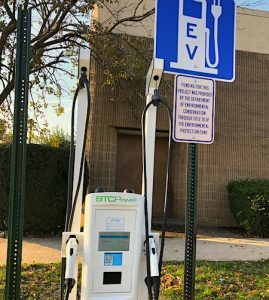 The village of Nyack has installed a two-port Level Two electric car charging station, located near Main Street at Cedar St & Artopee Way behind the Veterans Memorial Park gazebo. The Nyack charging station is part of the EV Connect network. Electric and plug-in hybrid car owners need to download the free EV Connect app from Apple’s App Store or Google Play to use the station. Charging is free, but visitors will still have to pay to park during regular Nyack municipal parking hours, Mon-Sat 11a-6p and 11p-6a. The Nyack EV station is one of 1,100 charging ports throughout New York to encourage the use of electric vehicles with the goal of reducing greenhouse gas emissions statewide 40 percent by 2030. The village doesn’t just get brownie points for being green — there are real points for Climate Smart communities that encourage sustainable transportation alternatives. “The Climate Smart program rewards improvements to sidewalks and intersections and the installation of bike lanes, as part of the federal Transportation Alternatives Program (TAP),” says Village of Nyack Sustainability Coordinator Marcy Denker. “Installing alternative fuel infrastructure and making it available to the public will earn Nyack points in the Climate Smart Communities certification program, which helps municipalities take meaningful actions to prepare for future impacts of climate change by reducing greenhouse gas emissions.” She says the recently completed Greater Nyack Bike Walk Master Plan and planned improvements to biking and walking infrastructure will help Nyack deliver on its efforts to be a sustainable community. Year to date electric vehicle and plug-in hybrid car sales are a rapidly growing segment of the US auto market. More than 232,000 cars shipped to dealers through September, representing a 63% increase over the same period last year. Bolt, E-Golf, Leaf, Tesla, Plugin Prius, Clarity, Ioniq, Fiat, Ford Focus EV owners and drivers of 20 other US EV cars can charge up for free while shopping, dining or just visiting the Village of Nyack on the Hudson River, located between Exit 10 and 11 on the New York State Thruway / I-287. Many thanks to Nyack News and Views for allowing us to share their story. View original here.